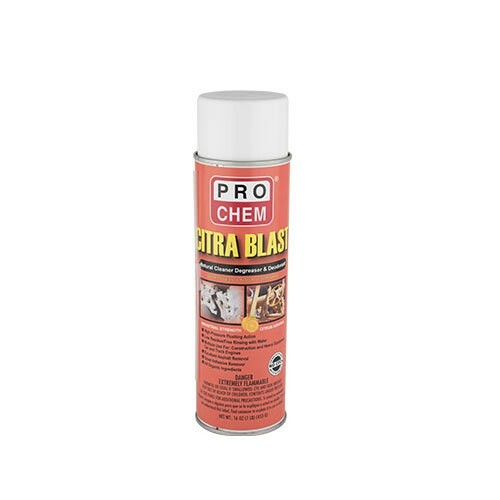 CITRA BLAST | Pro Chem, Inc.
CITRA BLAST is the perfect solution for cleaning and degreasing metal surfaces. Our environmentally safe formula is nonacid, noncaustic, noncorrosive and contains no petroleum distillates or chlorinated solvents. This biodegradable product is made from all organic ingredients and is a safe alternative to using chlorinated solvents. The high pressure spray blasts away grease and grime leaving a low residue, so the parts can air dry or be rinsed clean with water. Hold can approximately 8 inches away from area to be degreased. Spray liberally and allow product to penetrate grease, tar or grime. For heavy deposits, allow extra time in order to penetrate. For tougher spots and stains, agitate with a brush. Wipe area clean with a damp cloth or rinse thoroughly with water.